The Carian coast is known to begin in the Didim (Didyma) region, continuing to the Bodrum peninsula (Myndos, Halicarnassus), further to the Datca peninsula, Amos, Marmaris and all the way to the Dalyan river and ancient Kaunos (King Rock Tombs). After this area the Lycian coast begins. Our route begins from the breathtaking region from Marmaris and travels to the Datca peninsula (central coastal Caria), including the ancient city of Knidos (Cnidus). Today, it is still quite beautiful, blanketed with virgin landscapes and a variety of splendid coastal and inland villages to explore. Day 1 – On the first day of our journey travelers will embark in the charming harbor of Marmaris. 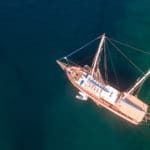 Depending on the time of your arrival to the harbor, either your private gulet will leave after all clearances have been completed to a nearby bay or cove, or there is also the option of spending an overnight stay in Marmaris in order to explore the sights. Day 2 – The following day of your journey brings you to explore Arabian Island and Bozukkale (Loryma). The waters are clean and refreshing. A great place for relaxing, snorkeling and swimming and simply exploring the sights. While enjoying your breakfast, your gulet cruise will take you to the Arabian Peninsula. The night will be spent in Bozukkale. In the historical city of Bozukkale (Loryma), there you will find ruins of the castle which stretches out in a rectangle with its city walls and 9 temples. The name Bozukkale means ‘crooked castle’ and might be associated with the fact that one side of the castle is missing. Due to its geographical location and the narrow port entrance, the port was also used by the Greek navy forces during the Pelepones Sea Battle. Karor, the Commander of Athens gathered all of his ships here before the Cnidus War in 395 B.C., and Demetrios; the son of Antigonos used this port for preparations before attacking island of Rhodes in 305 B.C. 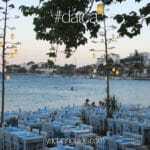 Day 3 – On this day, you will be spending your time in the Datca peninsula, shortly after breakfast. It is also a great opportunity to go ashore in the town while necessary provisions are restocked. The city of Datca was founded by the Dors who came from Aegean Sea to the southern coast of Ionia in the 7th century B.C. This semi-island has no humidity and very well known for its fresh air with plenty of oxygen. The great historian Strabon once quoted on Datca’s weather: “God would send his beloved servants to Datca to live longer”. According to a myth while the Spanish pirates were passing by the coast of Datca, they disembarked people with Hansen’s disease in Sariliman (Yellow Port) Bay and these abandoned people recovered from their disease with the help of the clean air of Datca. There will be an overnight stay in Datca or alternatively a nearby bay. Day 4 – A great region to relax and unwind. 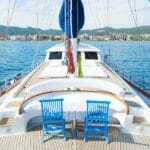 Shortly after a lovely breakfast, your private gulet will cruise to Aktur, followed by Bencik Bay. Bencik offers plenty of natural scenery once you pass through the narrow entrance. It is a favored place of anchorage – plentiful in clean waters for water activities – and quite peaceful as well. Bencik is situated at the narrowest part of the peninsula which divides the Gulf of Hisaronu with the Gulf of Gokova – however closer to Hisaronu. In 550s B.C. the people of Knidos wanted to dig a tunnel in the narrowest piece of land of the peninsula between the Hisaronu Gulf and the Gokova Gulf as a defence line against the Persians. That way they would make two peninsulas one island and their defense easier. They started with diligence, however unsuccessful. The city was conquered by the Persians. Guests on board will enjoy a great dinner, ideal barbeque spot and spend an overnight stay in the Bay. The stars shine plenty and bright in this region. So be sure to sleep on deck if you wish. Slightly past the middle of your gulet cruise, we come to day 5. Heading into the Gulf of Hisaronu, travelers will enjoy the delightful villages of Selimiye and Orhaniye. If you love doing plenty of water sports activities, then Orhaniye is the place. Not only that, it is also where you will find an opportunity to walk on water in Kizkumu beach (Maiden’s beach). Selimiye is a popular village due to its location and seafood restaurants. Not all are ideal but there are a few that stand out in service and dishes. Lunch will be served in Selimiye and dinner and overnight stay in Orhaniye. On the 6th Day, two breathtaking and blissful destinations will be visited on your gulet cruise in Turkey; namely Dirsekbuku and the town of Bozburun. While Dirsekbuku is a quite and peaceful bay on the Bozburun peninsula, the town itself offers a wonderful chance to see Turkish gulets in the making. Once in town, a private trip can be organized to explore the shipyards where a variety of gulets under construction can be seen. There are also a few restaurants with local cuisine including fresh seafood dishes – where fresh fish is caught daily can be enjoyed. 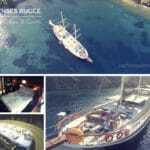 The last full day of gulet cruising. Your luxury sailing holiday will take you to Kadirga bay near Marmaris. A lovely area, again peaceful with not much in boat traffic except for the daily boat trips from Marmaris can be seen. More swimming, sunning and simply relaxing is possible. On your last day after breakfast, it is then time to disembark from your private gulet cruise holiday. Depending on your flight home, a transfer will be waiting to take you back to Dalaman airport. Should you have time and not had the chance to explore Marmaris before leaving on your trip, then this day could be a good time to look around and see some sights, do some more activities such as water sports, or shopping.